Today was another spectacular day to wake up in the "it Dreamlan" with the sheep bleating, the rooster crowing, and the sun gleaming through fluffy white clouds. After breakfast we would commute 35 minutes through the lush farmland to the nearest great city of Groningen. After sliding on narrow frontage roads along the canal, dodging bicyclists, and yielding to pedestrians every 50 yards, we found parking and ambled up to our destination: the stoic Martinikerk. The church foundation was laid in the 13th century and expanded generously in the 15th century, and then again in the 16th century. The architecture is varied and specific features evolved within the era in which they were built, beginning with the tall slender romanesque windows of the original chancel. As we gathered, we entered the church at the back. There, we met our host for the next two days, Erwin Wiersinga. Mr. Wiersinga is a Dutch organist and professor who lives in Holland and teaches both here in Groningen and in Berlin at the Universität der Künste. He had agreed to spend two days showing us some organs around Groningen. Erwin Wiersinga demonstrates the 1742 Le Picard organ in Martinikerk, Groningen. Upon walking into the cavernous space, he introduced us to the Martinikerk and gave us a brief tutorial of the major events in its history as well as its context within the city. The first room Erwin showed us was the high walled chapel at the top of the church's cruciform (named the "Choir") which was built in the 15th century and boasts original frescoes from the early 1400's. These frescoes, which had to be gently restored after being covered by paint for centuries, are completely stunning recordings of history and were thankfully given back to public eye once they were discovered buried under the whitewash paint. The Choir also featured another unique feature: a small, one-manual organ in French-baroque style. Having come from a monastery that was closed, this organ was originally the Positif division of a larger instrument. It has been repurposed to serve as an instrument to serve the Choir area of the church, which hosts weddings and smaller services. This was a very fun experience for those of us who traveled with the studio to France last year, as we had the perfect repertoire for exploring the instrument's characteristic timbres. 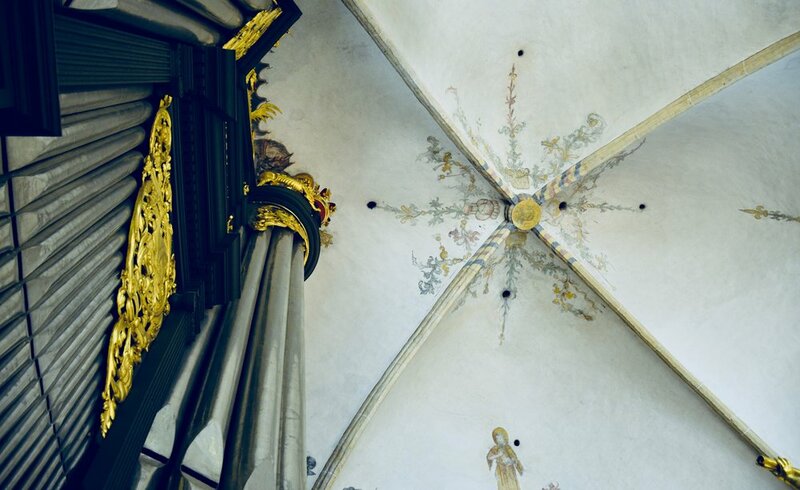 With mostly-original pipework from the 18th century, the sonic output was divine within the acoustic of the Choir, made all the more vibrant by its lofted ceiling. I particularly enjoyed hearing the french reed stop called a Trompette, as well as the brilliantly styled Cornet. Next we ventured to what Erwin called the "Great Queen." This incredible instrument, as conceived and built by Arp Schnitger in 1691/92, featured a deep forest green paint on the wooden case paired with brilliant golden leaved filigree throughout. Indeed, its case created a beautiful balance by centering your eye upon the façade of the Hauptwerk ("Great") division. 1692 Arp Schnitger organ, Martinikerk, Groningen. Two enormous pedal towers situated behind and outside of the profile of the Rückpositiv draws one's eye to the Hauptwerk at center. The earlier Renaissance era organ lives on within this instrument, its successor. The pipes of the Great division are housed in the skeleton of the original organ, but masked by the additions around it. The pedal towers display the only 32 foot pedal pipes built by Arp Schnitger still surviving today. The sonic flood that poured out from this Baroque masterpiece was monumental, to say the least. The foundation stops are crisp yet rich, and had clarity in their pipe speech. The mixtures add a balanced brilliance to the foundational tone and gift the instrument with a profound and sparkling top. Aside from the gorgeous case and perfectly voiced pipework, the organ also showcases some very interesting older stops that really expand the instrument's tonal palate. 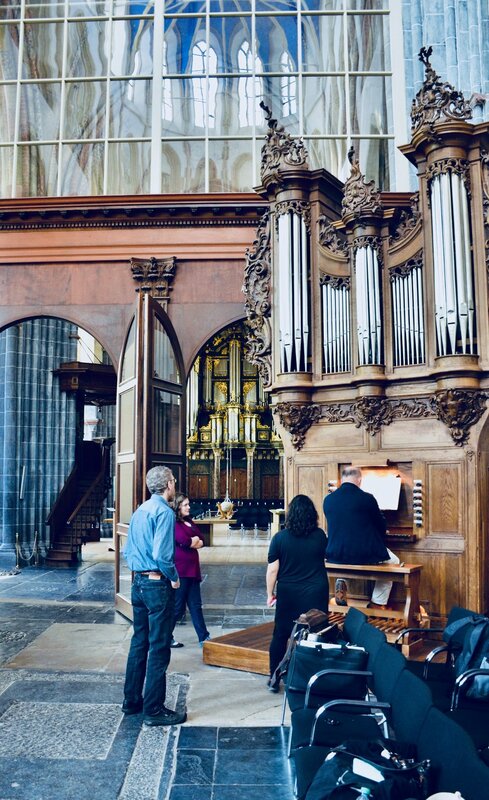 The baroque accent of this Dutch treasure is profoundly beautiful and I enjoyed listening to my colleagues play their repertoire on such a substantial instrument. After a masterclass with Mr. Wiersinga, I ventured on my own to the bell tower. Accessible to the public and requiring more then 300 steps to the top, the bell tower was a exciting excursion away from the great organ. The bell tower housed many immense bells which were still roped and operational for ringers to peal during special occasions. The church had installed infrastructure to allow the public to self tour the bell tower, exploring differenly sized chambers where the large bells lived. The first balcony was also accessible for viewing the city, as well as a final level which put the viewer just behind the clock faces under the bells that struck the hour. Martinikerk has the second largest bell tower in the Netherlands, second only to the Dom tower in Utrecht. When I felt satisfied with height, I returned to the sanctuary to listen to the rest of my colleagues explore the Great Queen. Members of Boston Organ Studio at Martinikerk, Groningen. 1692 Arp Schnitger organ. Nieuwe Kerk, Groningen. 1831 Pipe Organ. Toward the end of the day we ventured to one final organ in an old church, interestingly named "New Church," just a 10 minute walk away. This church had been restored and restyled in the 19th century and had hints of romantisicm and steampunk all around it. The instrument had even more recently been restored, as Erwin is currently preparing a dedication recital for the unveiling next week. This instrument was more demure then the Great Queen with which we had spent most of the day. It contained many more 8-foot stops of varying character, and put out a much more subtle accent. We all chose to play our late 18th century and 19th century romantic music for this beauty and she did not disappoint. My favorite stop was an 8 ft. transverse flute stop that was exquisite for a solo line in my Mendelssohn "Theme and Variations in D."
After a lovely dinner in the hustle and bustle of a busy Thursday night crowd with Erwin, we returned home to splinter off and enjoy some quiet time before hitting our pillow to rest for another day of music and adventure in small villages around Groningen. 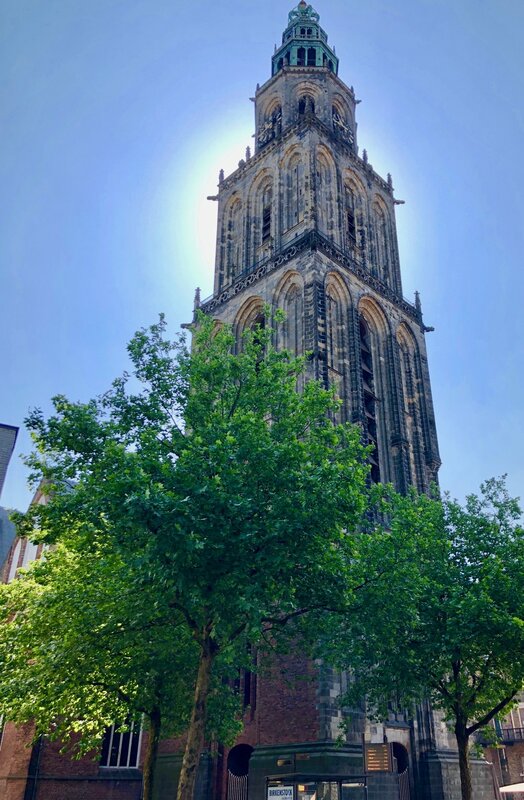 The tower of Martinikerk, Groningen. 1742 Le Picard French baroque organ, Martinikerk, Groningen. Erwin Wiersinga demonstrates the 1742 Le Picard organ in Martinikerk, Groningen. Boston Organ Studio. 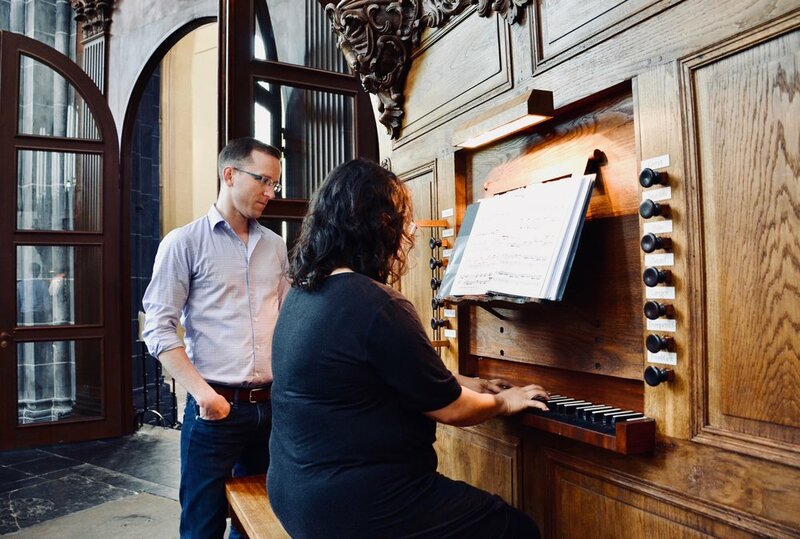 Jennifer Hsiao plays the 1742 Le Picard organ in Martinikerk, Groningen, with Christian Lane. Boston Organ Studio. 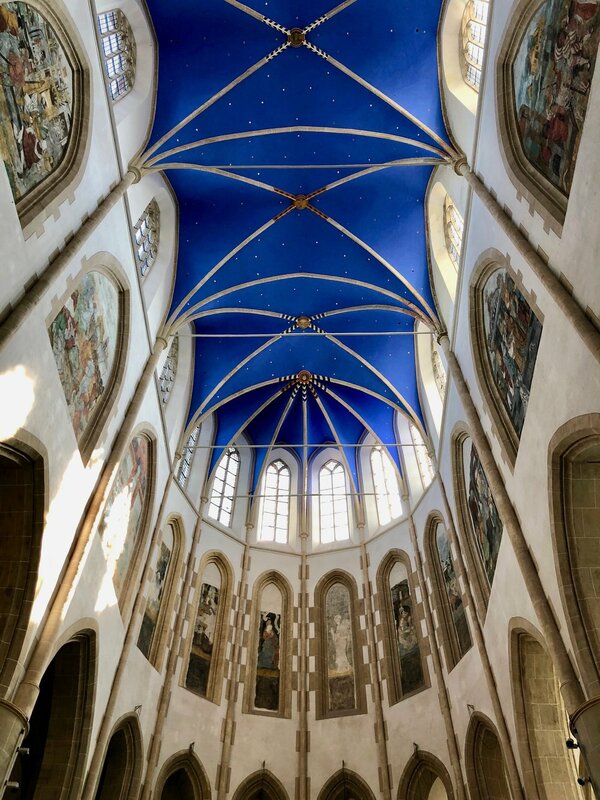 The Choir vault, Martinikerk, Groningen. 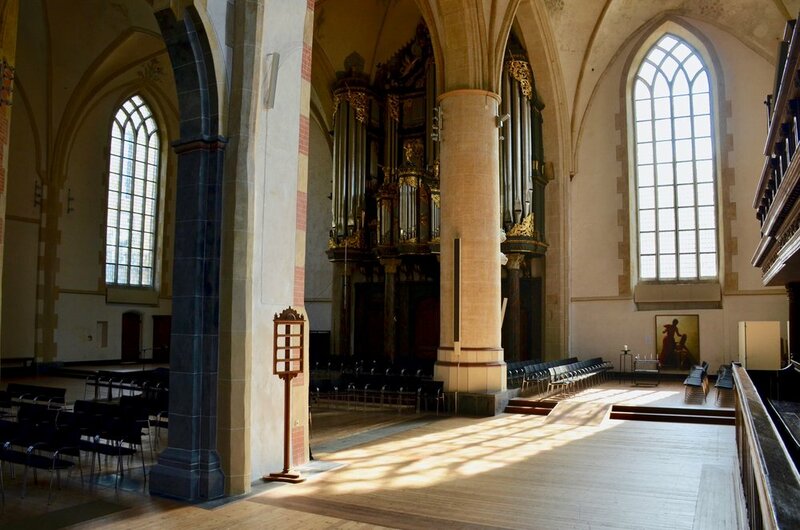 1692 Arp Schnitter organ as viewed from the Quire, Martinikerk, Groningen. 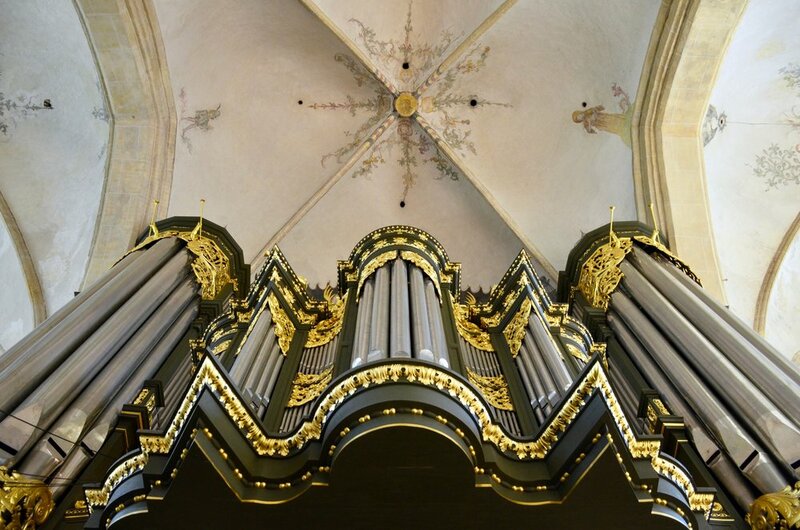 1692 Arp Schnitger pipe organ, Martinikerk, Groningen. Façade, 1692 Arp Schnitger pipe organ, Martinikerk, Groningen. Corey De Tars plays 1692 Arp Schnitger pipe organ, Martinikerk, Groningen, with Christian Lane and Erwin Wiersinga looking on. Erwin Wiersinga coaches Brandon Santini. 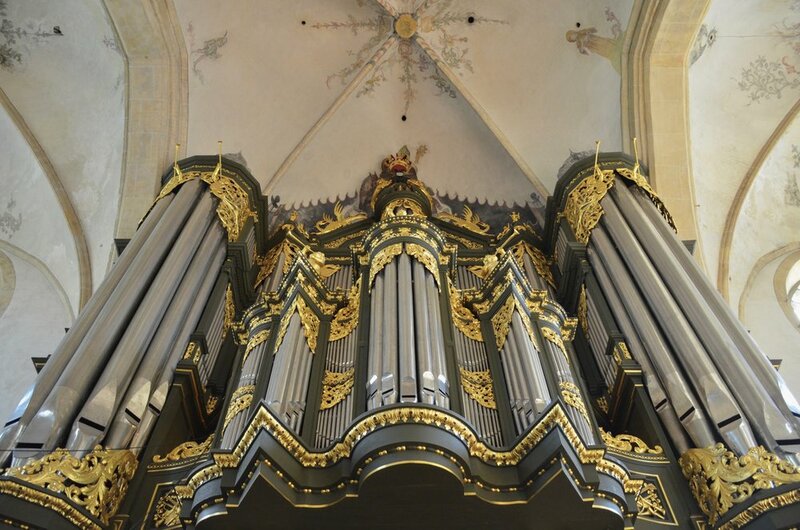 1692 Arp Schnitger pipe organ, Martinikerk, Groningen. Boston Organ Studio. Jennifer Hsiao at the 1692 Arp Schnitger pipe organ, Martinikerk, Groningen. Erwin Wiersinga coaches Adrian Cho, 1692 Arp Schnitger pipe organ, Martinikerk, Groningen. Boston Organ Studio. 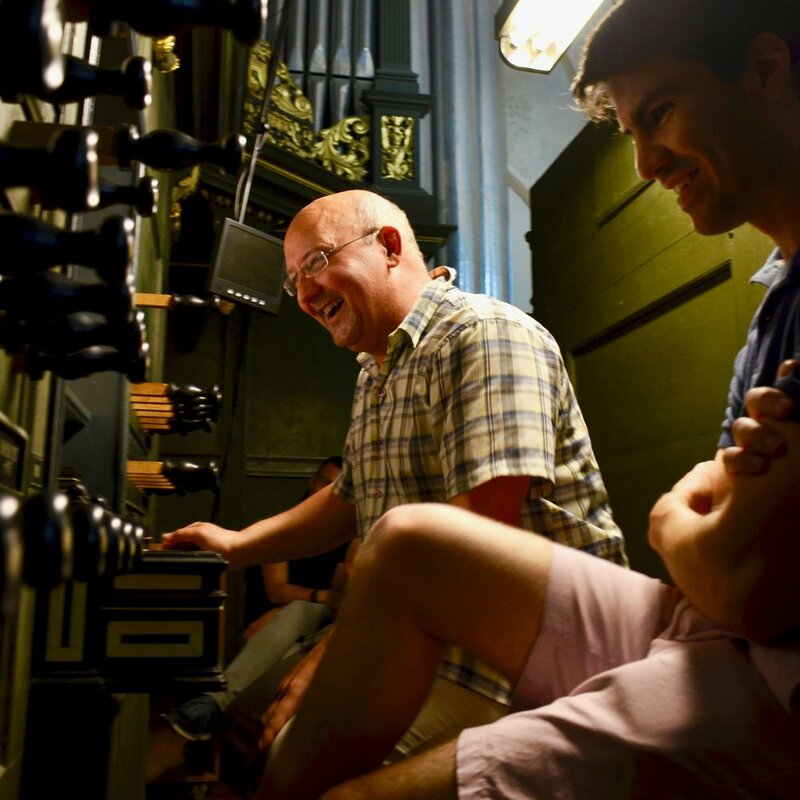 Chris Porter at the console of 1692 Arp Schnitger pipe organ, Martinikerk, Groningen. Console detail, 1692 Arp Schnitger pipe organ, Martinikerk, Groningen. Corey De Tar at the console of 1692 Arp Schnitger pipe organ, Martinikerk, Groningen. Façade detail, 1692 Arp Schnitger pipe organ, Martinikerk, Groningen. The lunch place in adjacent to the Martinikerk, Groningen. Approaching the Nieuwe Kerk, Groningen. 1831 in Nieuwe Kerk, Groningen. Pulpit in Nieuwe Kerk, Groningen. Console detail, 1831 organ, Nieuwe Kerk, Groningen. Chelsea Keating at the console of 1831 pipe organ, Nieuwe Kerk, Groningen.